The lively and intellectual ENFP is one of the most exhilarating personalities to be around. They exude enthusiasm and are fueled by possibilities that inspire the world around them. They are agents for change, always seeking to improve the world and explore all it has to offer. ENFPs are driven to see the potential in everything; to see not what “is” but what “could be”. They live in a constant world of ideas, meanings and promise. To the ENFP the world is full of unending prospects and adventures; all must be explored and each day must count. The ENFP combines a thirst for discovery with a strong set of inner values that guides them in all their explorations. If you know an ENFP, what you’ll see is their eye for possibility. Their dominant function, Extraverted Intuition, works like an idea-generating machine. They see potential everywhere and they feel compelled, almost irresistibly, to make their dreams a reality. ENFPs are the friends that will inspire you when you feel down, who will have the amazing “crazy” ideas that are just so unique they might actually work! They are wildly intellectual yet rarely arrogant. Famous ENFPs include Mark Twain, Anne Frank, Salvador Dali, and Ellen DeGeneres. Extraverted Intuition (Ne) is the dominant function of the ENFP and the ENTP. Ne-dominant personality types pour their energy and enthusiasm into their projects and ideas, seeing inspiration everywhere they go. They become absorbed by their visions of what could be, and this devotion to their ideas will pull them to any number of new experiences. They may forget to eat or sleep as they pursue their dreams and passions. At night as the lie in their beds, chances are their minds are filled with numerous options and ideas that beckon them to stay awake just a little longer. While the life of an ENFP seems exciting and inspiring to many, they often struggle with maintaining their focus. Life calls to them at every possible turn, urging them to explore another angle, another rabbit-trail that can lead them to yet another new discovery. For this reason they often jump from project to project, idea to idea, and have to work with extra determination to complete projects they start. When they do achieve their dreams, they take their time to find creative improvements and novel flairs that make their works truly one-of-a-kind. One of the best ways to understand Extraverted Intuition is to compare it to its alternative; Extraverted Sensing (Se). Extraverted Sensing is all about making the most of what “is”. It’s about enjoying the moment, living for the now, taking advantage of current opportunities. Se-users are concrete and practical, yet adventurous (a trait they share with Ne-users). Ne-users focus on what “could be”; they have less interest in “now” and more interest in what is yet to come. They focus on improving and innovating, with less interest on accepting things for what they are. They are adventurous, like Se-users, and often energetic, like Se-users, but their main focus is in tomorrow, in exploring the new, the never-before-explored. They dislike the practical and yearn for the undiscovered, the theoretical, the abstract, the “magical”. They are also quick to spot underlying meanings, themes, and patterns. According to Dario Nardi, a UCLA professor and expert in the field of neuroscience, ENFPs use trans-contextual thinking. This is a process where the neocortex is highly active in many different regions, and each region is highly amplified and out-of-synch with the others. Each region is doing its own thing to generate a “surprise” result! Ne-types are rapidly creative, coming up with metaphors and out-of-the-box conclusions that are clever and often surprising! They have creative “highs” that push them to discover and pursue their passions and inspirations of the moment. Their brains are highly energetic and imaginative and the ENFP experiences “creative hangovers” when they wear themselves out by constantly using intense, fast-paced mental energy. ENFPs may seem like a bundle of contradictions to their loved ones. They are friendly yet autonomous. Socially aware yet prone to playing devil’s advocate. They can go from being the life of the party to a total bookworm. ENFPs are anything but simple and as a result they can be an enigma to the people who know them. ENFPs may seem on the outside to be full of liveliness and charm. They ARE these things, but they are much more than that. They crave intellectual discussion and feel bored and restless if they have to focus on small-talk, everyday banter, or superficial topics. 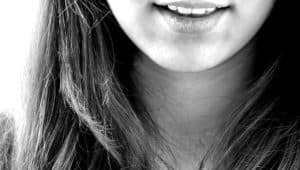 Because they are extroverted and tend to be friendly many people will gravitate towards them, but this may result in the ENFP unwittingly being a part of discussions that don’t naturally stimulate their Ne-dominant mind. In conversations where the focus is about practical realities or the day-to-day aspects of life, the ENFP can become bored and restless. If they can’t find imaginative, intellectual discussion with the people around them, they may revert more towards isolation and accessing their imagination through writing or reading on their own. ENFPs love to be around people, but they don’t want to need people. They may spend weeks with a particular group of people, and then hitch a ride to the other side of the country because they need to explore something new and different. Their autonomy is very important to them and, as a result, they need to take breaks from routine regularly to explore a new part of life or a new environment. 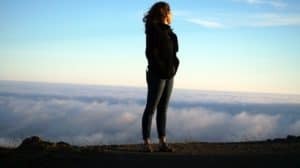 ENFPs are very socially aware and desire to connect with people, but they are also intensely independent and individualistic. They love to make people laugh or feel joy (think Robin Williams or Ellen Degeneres) but they also aren’t afraid to stand up for the unpopular opinion. ENFPs see numerous angles to every statement, and as a result, ENFPs don’t like “blanket” statements or black and white rules. They may go from being the friendliest person in the crowd to the staunchest advocate against the status quo in the blink of an eye! Lastly, ENFPs are incredibly passionate and driven individuals. However, they have thousands of ideas that infiltrate their minds daily. They feel a simultaneous push and pull between exploring their passions and being distracted by new and different activities or theories. This process can make it hard for them to complete projects, and can get them mislabeled as “lazy” when they are anything but. ENFPs work tirelessly to explore their interests and make their ideas a reality…there are just so.many.ideas. What to do about all the ideas? Some ENFPs schedule in “brainstorming/new idea” time with their work so they don’t get bogged down in work and then just cast it aside altogether. Some ENFPs project to the future of where they want to be and then use that as a motivator for getting something done now (i.e. “When I have a clean room I can brainstorm and create without feeling distracted by the state of my room”). Others play their favorite music while they clean or do a mundane activity so that they can let their mind wander and still be productive. At some point I want to write more about ENFPs and productivity, but I need to research more first. – ENFPs are among the three highest on one measure of creativity. – They are highly represented among third- to sixth-grade academically talented students. – As teachers, they are less likely to see student behaviors as serious problems. – In a national sample study on leisure activities, ENFPs were overrepresented in enjoying writing, appreciating art, playing musical instruments, listening to music, and reading. – The most important features in an ideal job to ENFPs were creativity and originality. Want to know more about ENFPs? Check out these amazing books! Regarding productivity – I do need some form of background noise going, also – I seem to be more productive when I’m juggling a few “projects” all at once – when I’m not distracted by something shiny…. Classic ENFP problem I’m sure! 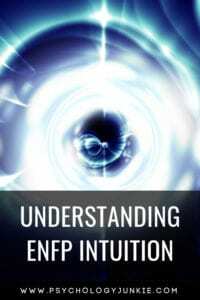 Reading your article, “Understanding ENFP Intuition”, I am astounded by how “in tune” you are. In the back of my mind I am thinking, “Get out of my head!”. 🙂 But really, your article on things to never say to an ENFP, that got me back here today — you’ve articulated a lot of things that I only vaguely intuited. You’ve made me a real believer in this science, and I do not use the word lightly. Thank you so much John! I really am glad you enjoyed the article and found that it resonated with you!